Published on September 10, 2018 in Daily Dirt, Industry Activities and National. Closed Tags: China, compact excavators, construction, construction industry, equipment, John Deere, Wacker Neuson. 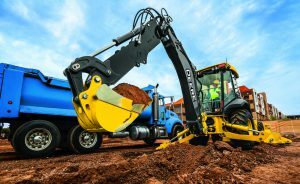 As demand for John Deere construction equipment increases around the globe, the Moline-based manufacturer is entering into a strategic supplier agreement with Wacker Neuson to initially provide compact excavators in China, Southeast Asia, and Oceania. The models will range from 1.7-7.5 tons (1700-7500 kg) and are specifically designed and manufactured for customers in the growing Asia-Pacific marketplace. The objective of the partnership is long-term collaboration in key growth markets. While both companies are committed to long-term strategic collaboration, the agreement will run for five years and can be extended in five-year increments. 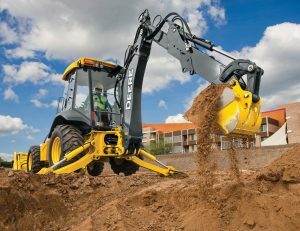 The initial rollout of four compact excavator models will begin in early 2019, and will predominantly be sourced from the new Wacker Neuson factory in Pinghu, China. Service and support of these machines will be offered through the John Deere dealer network. The Wacker Neuson Group is an international family of companies headquartered in Munich, Germany. As a leading manufacturer of light and compact equipment globally, they have over 50 affiliates and 140 sales and service stations. 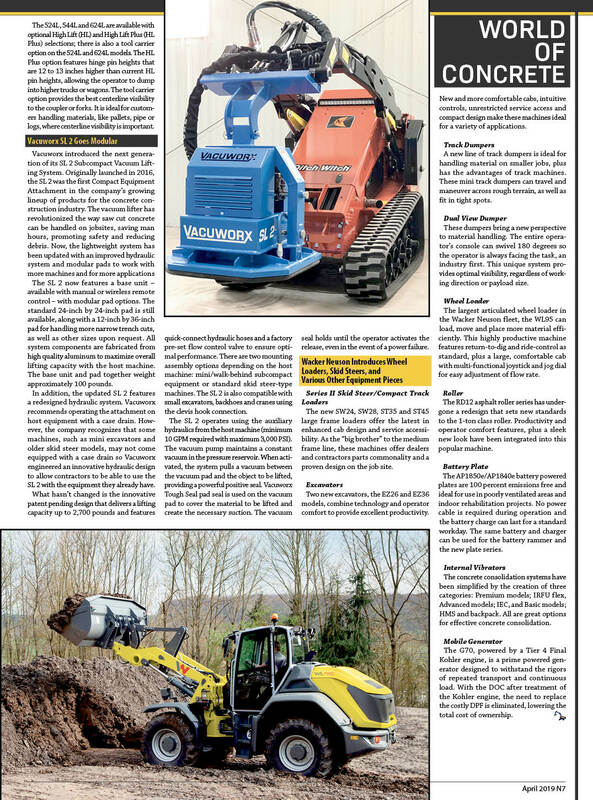 Published on July 8, 2017 in Equipment & Products and National. Closed Tags: attachments, construction, construction industry, equipment, heavy equipment, infrastructure, John Deere, L-Series backhoe, Sealed Switch Module (SSM). Updates to the John Deere L-Series backhoe lineup enhance the productivity and uptime for professionals looking to lift more and multitask on the job site. 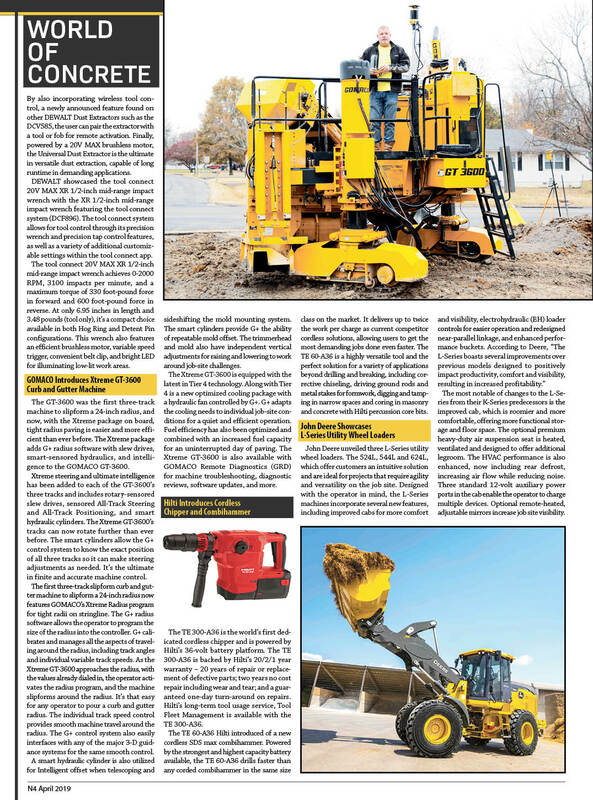 The key backhoe updates include the introduction of precision mode, enhanced pilot controllers, two new rear quick coupler offerings and a redesigned hydraulic thumb. John Deere also improved the pilot controller — increasing the metering range by 16 percent — which enhances operator feel at the control helm. Additionally, engineers enhanced consistency between functions (acceleration and deceleration) for smoother operation and reduced system oscillation. Fleet managers looking to get the most out of their L-Series backhoes can rely on their John Deere dealers to provide Ultimate Uptime, featuring John Deere WorkSight. With Ultimate Uptime, owners receive predelivery and follow-up inspections that include five years of JDLink™ telematics, machine health prognostics, remote diagnostics, programming capabilities and the ability to add dealer-provided uptime solutions to a customized package. Published on June 1, 2017 in Daily Dirt, Events and National. 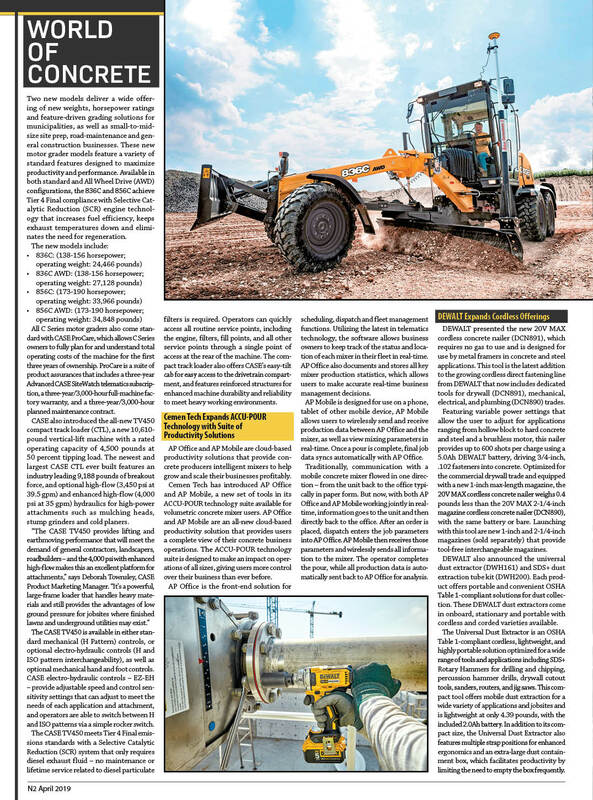 Closed Tags: BENNINGHOVEN, CIBER, construction, construction industry, contractors, Deere & Company, Deere’s Worldwide Construction & Forestry Division, HAMM, heavy equipment, John Deere, KLEEMANN, VÖGELE, Wirtgen, Wirtgen Group. Deere . Deere & Company’s announcement is available at www.JohnDeere.com. A conference call for investors regarding the transaction was held at 10 AM ET on June 1, 2017. When an archived version of the conference call or additional news is available it will be posted on this site. Headquartered in Germany, the Wirtgen Group has five premium brands across the entire road construction sector spanning milling, processing, mixing, paving, compaction and rehabilitation. 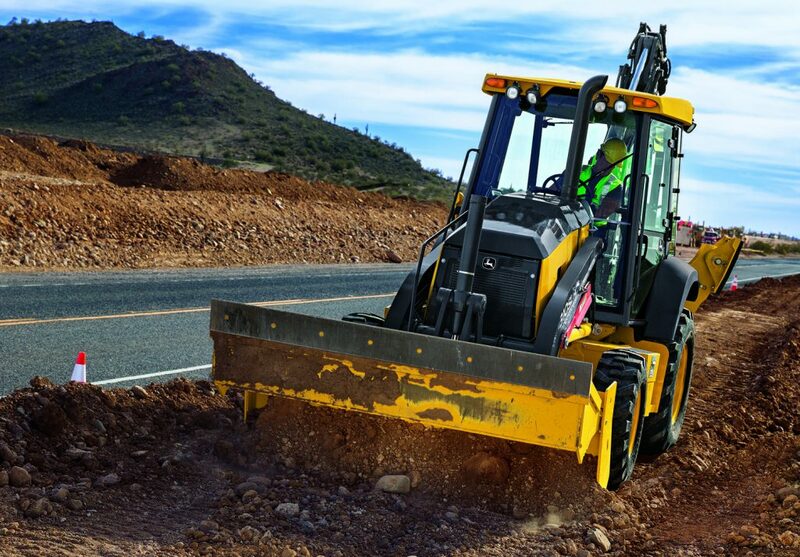 Wirtgen’s highly complementary product portfolio enhances Deere’s existing construction equipment offering and establishes Deere as an industry leader in global road construction. The Wirtgen Group has a global footprint with approximately 8,000 employees and sells products in more than 100 countries through a large network of company-owned and independent dealers. Deere plans to maintain the Wirtgen Group’s existing brands, management, manufacturing footprint, employees and distribution network. The combined business is expected to benefit from sharing best practices in distribution, manufacturing and technology as well as in scale and efficiency of operations. The transaction has been approved by Deere’s Board of Directors. The purchase is subject to regulatory approval in several jurisdictions as well as certain other customary closing conditions. The companies said they expect to close on the transaction in the first quarter of Deere’s 2018 fiscal year. The WIRTGEN GROUP (www.wirtgen-group.com) is an internationally operating group of companies in the construction machinery sector incorporating the traditional product brands: WIRTGEN, VÖGELE, HAMM, KLEEMANN, BENNINGHOVEN, and CIBER. As a technological leader, The Wirtgen Group offers its customers mobile machine solutions for road construction and road rehabilitation and plants for mining and processing minerals or recycling material and for the production of asphalt. Deere & Company (JohnDeere.com) is a world leader in providing advanced products and services and is committed to the success of customers whose work is linked to the land – those who cultivate, harvest, transform, enrich and build upon the land to meet the world’s dramatically increasing need for food, fuel, shelter and infrastructure. Since 1837, John Deere has delivered innovative products of superior quality built on a tradition of integrity. 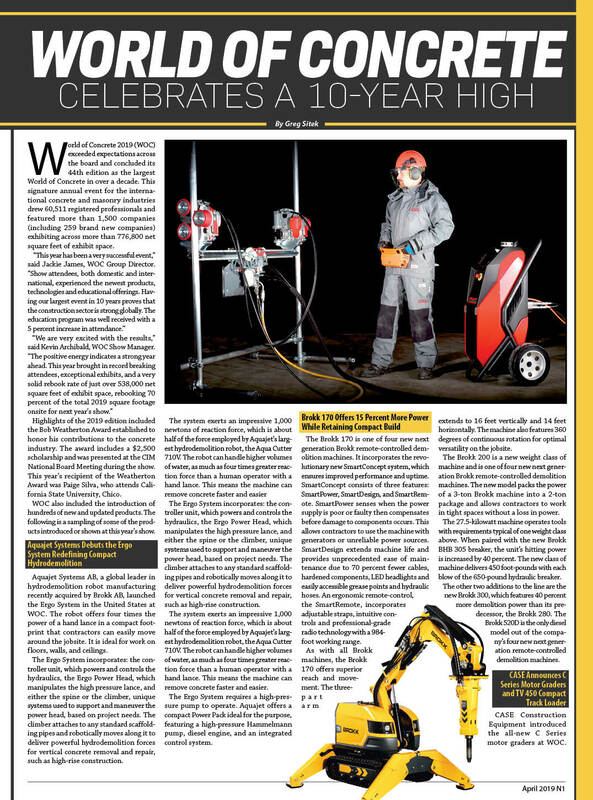 Published on April 26, 2017 in Daily Dirt, Equipment & Products and National. Closed Tags: 944K hybrid wheel loader, 944K loaders, construction, construction industry, contractors, EPA Interim Tier 4 engine (IT4), heavy equipment, infrastructure, John Deere, John Deere Construction & Forestry, Mining, quarry. On the heels of its most successful CONEXPO-CON/AGG ever, John Deere is now offering a 96-month (eight-year)/20,000-hour power electronic components warranty on the 944K hybrid wheel loader. The warranty is retroactive to existing machines in the field and provided on new 944K loaders through October 31, 2018. The warranty includes a 96-month (eight-year) or 20,000-hour (whichever comes first) non-prorated assurance on wheel motors, generators, power inverters and brake retarders. Certain customer conditions must be met to maintain warranty coverage. This includes component rotation between 15,000 and 18,000 hours; drive voltage cables replacement between 15,000 and 18,000 hours; and an annual dealer machine inspection. The 536 horsepower 944K hybrid wheel loader features an EPA Interim Tier 4 engine (IT4), and it can provide significant fuel savings over 9-yard3 loaders with conventional drivetrains*. 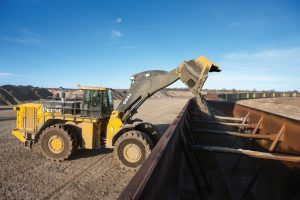 The production-class wheel loader’s brushless AC generators and motors, water-cooled brake resistors and solid-state power electronics deliver reliable, long-term performance to quarry and large-load applications. *Actual fuel consumption rates and savings will vary with machine application, utilization, operator and model of competitive unit.